Clashes broke out at an anti-fascist rally in Cremona, Italy when around 2,000 protesters took to the streets to object to an attack by far-right group supporters. The fracas left a political activist in hospital. A couple of thousand anti-fascist protesters attended the rally on Saturday, which started off peacefully. The protesters marched through the city center chanting slogans and waving banners to draw awareness to the plight of anti-fascist activist Emilio Visigalli, who is currently in hospital in a serious condition, following last week’s attack by the far-right group CasaPound. He was injured when the event organized by the CSA Dordoni cultural center was attacked on January 18 by dozens of neo-Nazi supporters. However, midway through the rally, a group of youths appeared wearing helmets, dressed in black and carrying sticks. They began to throw stones, bottles, flares and smoke bombs at the police. 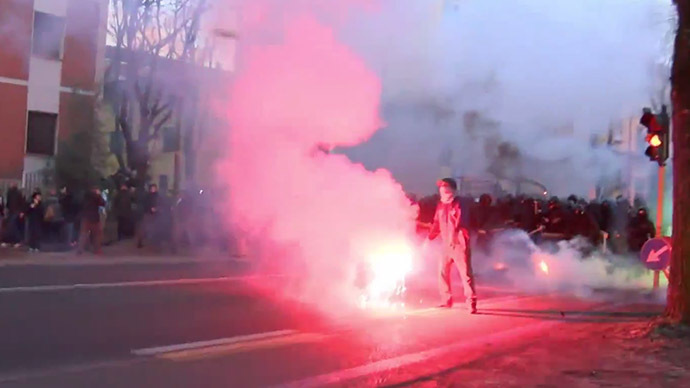 Law enforcement officers responded by firing tear gas at the rioters, who according to the Turin based newspaper, La Stampa, had arrived from different parts of Italy. The standoff lasted for around two hours. Local reports say there were no direct clashes between the police and the rioters. According to La Stampa, the protesters were trying to reach the headquarters of CasaPound, and broke windows of shops and banks in the process. The fire brigade even had to intervene after the windows of the headquarters of the local police department were vandalized. Tensions in Cremona between left and right wing groups have been boiling for the last week. On January 18, members of the far-right group CasaPound gathered to watch a local football match, which included members travelling from Parma and Brescia to offer their support. Following the game, the group marched towards the headquarters of the Dordoni cultural center –left leaning and champion of local residents’ rights. Emilio is well known in Cremona as an anti-fascist activist. He was severely beaten as around 40 far-right supporters lay siege to the center. Activists working with the center complained that police merely identified the offenders and they were released without charge. However, according to their version of events, law enforcement officers decided to arrest activists aligned to the Dordoni center, despite them being heavily outnumbered and they were defending their property.